Discussion in 'Habitat Forum' started by Neighbor Guy, Feb 10, 2019. In my experience predator cones are a waste of time, energy, and money on these set ups. They are placed over water and mounted on galvanized poles 5 1/2-6’ off the surface. Any raccoon or otter with wet feet can’t make the climb. And we don’t have watersnakes in MN. In all my years of putting boxes over water in this method I have never lost a nest due to predator. If I was using a cedar post or mounting to a tree, then I would consider a predator cone. Just not for this application. Most importantly- where’d you get the avatar pic of the tufted duck? I found it while looking for reference photos for a ringneck duck decoy project. I liked it cause he was having a bad hair day. In over 36 years of installing and maintaining 25 nesting boxes, I saw a significant increase in hatch rate in boxes that were utilized. Only a slight increase in number of boxes nesting. Average hatched eggs went from a little under 4 hatched eggs per nested box to just under 9 hatched eggs per nested box. But that's in another area than yours. Well, good luck and thanks for putting them up, they're nice looking boxes!! You ever consider some tiny boxes for Bufflehead? It sounds like you might be just north enough. Easy answer, yes I have considered it. I even have the information on the size of the hole they need or prefer on their boxes. This part is going to get a little science crazy, so please bear with me. Here’s the rub. 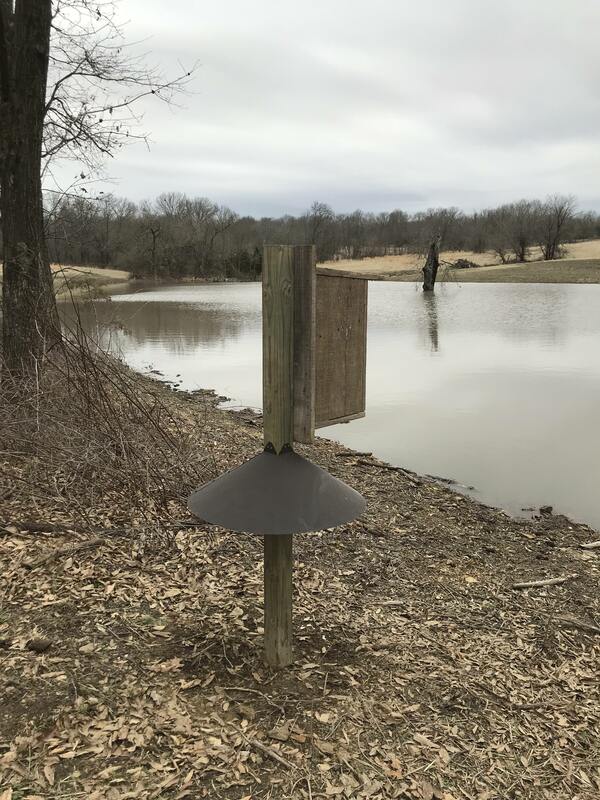 Woodducks, hooded mergansers, and goldeneyes prefer to nest in boxes mounted to trees 8-20’ off the ground. At home, I have a way to do that in my yard and my neighbors yard. That said if there are no high boxes available, they will nest in mounted boxes as low as 6’ off the ground. In this case I do not have access to trees so they needed to be mounted over water. Buffleheads rely on nests created by northern flicker and red bellied woodpeckers. So boxes need to replicate them. Those nests need to be mounted 13-18’ off the ground. Buffleheads will not use a nest box that is less than 10’ off the ground. I don’t have access to areas that I can hang boxes at that height. I wish I did, and am working with some resort and property owners in my dads area of the world to try to gain access for additional boxes in the future. I’d give it a shot with a couple boxes anyway. You have a great learning opportunity living in the breeding range. I believe there is some truth to the leap theory, however I have raised domesticated woodies and hoodies that only ever leapt from the incubator to my hand to the wet brooder -they did all right without being dropped. The biggest hurdle is- they have to be shown how to eat or they starve. Wood ducks are actually harder to get started (eating) than mergansers. Yes,wood ducklings are not that easy until I learned a couple tricks from the "old timers" who raised these birds successfully. When I raised migratory water fowl, the first clutches of woodies would run around the brooder three days...all.died. I would stick the bill.of the duckling in the water and the food,Then I started sprinkling little bits of food on the backs of the babies and some would find the food and start eating,also had a small container of water that dripped into a pan that helped the birds find the food,but would still loose a few, also tried meal worms in the food to get their interest also Would get on a ladder and drop the youngsters in a kiddie pool...still lost some So,I went to an old guy who raised these birds for over fifty years. That guy had taped a hen wood duck calling up to the nest as the babies jumped out. I made a copy of his and played it when I first put them in the brooder and never had any more issues with baby wood ducks. I put this one up a bit on the late side last year on a new pond. Built with ancient barn cypress boards off a family hog barn. It wasn't used by anything. If it misses again this year I will move it elsewhere and get it higher off the ground. Looks low in the picture but the hole is about 6 feet up. Some interesting and useful stuff here.